I got my bike sorted, and rode on anyway. At least I wouldn't be under pressure to ride at the pace of the peloton ! I decided I would nevertheless ride as fast as I could in order to test myself - also I wanted to be finished by lunchtime. I had sight-seeing to do ! It turned out that a number of other riders had had mechanicals (mainly punctures) as a result of the bumpy descent out of Sant'Agata sui due Golfi. At intervals I would see a rider standing at the side of the road with their team mates while he made the necessary repairs. That made me feel re-assured to know I wouldn't be alone. The descent to Sorrento was just as pleasant as I had imagined. A few late comers overtook me at a phenomenal pace. I would've liked their company, but I wasn't ready to follow them at such a kamikaze pace. This was also the case when we hit Sorrento town and had to negotiate the traffic - mainly tourist coaches. This was worse than the City of London at rush hour ! How could they allow so many tourist monsters on the road ! Some cyclists took great risks squeezing between buses, but I was just not sure I could do so without me or my bike getting squashed ! So I just stayed where I was, preferring to lose even more time on the bunch than damage my bike or get a bruising. I was definitely disadvantaged riding outside of the race. If I'd been with the main bunch we would have been chaperoned by the whole caravan of vehicles. The traffic would have been stopped for us, and the peloton would have had a free run. On my own, I was just another cyclist - albeit with a race number on, but that still wouldn't give me the right to a clear road through the town. In the crowded street with Sunday morning shoppers and tourists I felt a bit daft and out of place riding around with a race number on, but with no apparent sign of a race being on ! I probably had the air of a sheep that had lost the rest of its flock ! Once out of Sorrento and Vico Equense the road was largely clear. I managed to get a rhythm going on the bike and caught a few riders on the drag up to Castellammare di Stabia. The broom wagon, which was standing in a layby on the main road tooted at me as the folks enquired if everything was ok. Yes, everything was fine, apart from missing the draft of 500 people to pull me along ! Shortly after Castellammare the main climb up to Agerola began. I felt comfortable doing this, as I'd only been on this road the day before yesterday. Soon I caught a guy who I'd thought was going quite slowly. I passed him, but realised he had latched onto my wheel. Great - a drafting partner for the climb ! We then took it in turns to tow each other up the hill. I found it difficult to concentrate on the hill and think in a foreign language at the same time, so kept my conversation to very simple talk. "Que Lungo, quanti chilometri ?" Near the top, just outside the tunnel, we met another cyclist at the side of the road. He latched onto the front and gave us a tow through the tunnel. That was very useful as he was pretty strong and was able to get us out of that cold dark place pretty quickly. We then sped down the hill to Agerola, where the first feed station was placed. I'd expected a long table flush with lots of food for people to stop at, browse the fare, and choose what to eat and drink. In fact this feed station was more like what you get in a road race - people stood at the side of the road handing out bottles and food that you were meant to grab quickly while you were riding along. You weren't expected to stop. As I didn't trust my food grabbing skills I stopped, picked up 3 fruit bars and a bottle of water and then arranged everything in my saddle bag and pockets. Not very elegant I know. Of course with all this faffing I lost the others that I'd been with and was once again on my tod. 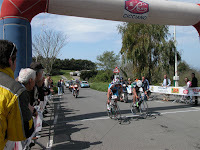 They had probably arrived in Amalfi (10kms downhill) by the time I was getting going again ! As I made my descent I found the 180 degree turns a bit difficult to negotiate so took them at slow speed. I was soon caught by 2 guys in yellow. "Vai con noi", one of them shouted. They'd obviously sensed I was having difficulty so they invited me to follow them. Having someone's line to follow made all the difference, and I was able to take the descent confidently at speed. I didn't have time to contemplate the dramatic coastline or the rocky surfaces, or the cool blue sea. I was just following this yellow back-side - keen to not make any errors on the corners ! We passed 6 or 7 people, during this descent. That made me feel good. After Praiano the road started to undulate and we began climbing up to Positano. The guys in yellow shot up the climb. I couldn't keep up with them, so just settled into my own pace. I just kept a steady rhythm, keen to save a bit of energy for the really steep ramps near the end of the course. 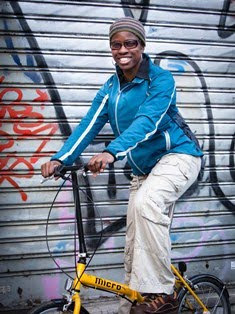 As I climbed up to Positano I realised this wasn't such a lonely ride for me, as I was constantly catching people. Some of them I passed, others I managed to work with. After Positano we headed inland, and so took in a few more climbs - colli San Pietro, Picco San Angelo. At the top of this climb was Sant'Agata and the event HQ. There were guys hanging around, who had clearly finished some time ago and were warming down. It was so tempting to turn left and just go up to the finish line - but I knew I had to do the remaining 12 miles, along with the group I was with. We then plunged downhill on the road back towards Sorrento - the road we had done first thing this morning. At the bottom of the descent, instead of going straight on into Sorrento, this time we took a sharp left to Massa Lubrense. A group of riders were arguing with a policeman who had directed them the wrong way. They'd apparently missed the left turn and had ended up going all the way into Sorrento before realising they'd gone off course. The policeman was looking pretty sorry as the riders remonstrated. I couldn't imagine riders arguing like that in England. With this group of riders joining our group, we became a peloton of around 25 riders. That was good for the morale, as I was beginning to feel a little tired, and the road began to rise up again. The road went uphill relentlessly for around 4 miles, passing through little villages - Termini, Metrano, Madonna de la Neve. The chatting that had previously been going on stopped, as people were feeling the toughness of the race, especially as the sun beat down. The peloton became strung out. I actually found myself near the front of the string, which made me feel confident. I felt spurred to dig in and make my best effort to keep with the leaders. The local village-folks we passed called out Bravo, Brava etc. from over their Sunday lunches. If only I could've stopped to join them. This was probably the longest 4 miles of the race. Finally I saw the red finish gantry 200m away. I could barely manage a sprint for the line as the 2 guys ahead of me cranked up the pace on the final 10% ramp and left me behind. I crawled over the line, my face full of sweat and salt. "Good ride", the finish marshals said to me. "It was very difficult", I replied in English. I made my way back to the event HQ, relieved that it was over, and pleased that I'd managed to get back in time for lunch. 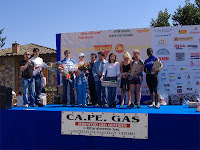 The prize presentation, as is often the case with these Italian events had quite a lot of fanfare. Chairs and tables laid out in front of as stage, an MC, music, generous prizes. It seems they really appreciate their women riders. I finished 8th woman, and was called up for a prize. Apparently 10 women (out of a field of 700) took part, and we all ended up with prizes ! I got a box of local wines and an alarm clock (which would have come in handy earlier that day !). This was to add to my goody bag of more local wine, some limoncella, pasta, and a cuddly toy ! We were also fed a 3-course meal, and I enjoyed the company of some local Italian cyclists who were keen to chat to me ! Not bad for 23 euros ! For what had seemed like a very unsure start to events, I'd ended up having a good day out. I'll probably do this race again next year. Thanks to Federico Pecchia and Francesco Cioffi for their warm welcome and for putting on a great ride. So Why Go to the Amalfi Coast ?